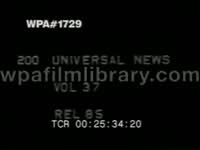 The 1964 Presidential Election! - A Public Service Feature. 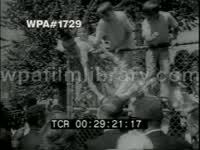 As Americans prepare to go to the polls November 3, hopefully more than two-thirds of eligible voters that exercised this precious privilege in 1960 - your Newsreel offers close views of both Candidates and what they stand for. Look. Listen. Barry Goldwater standing at a podium. Republican Convention at Reunion Arena. President Johnson shaking hands with he public. Voting machine. MCU ballot booth. Elevated views of city streets. LS pan people waiting in line outside to vote. MSs people casting their ballots. 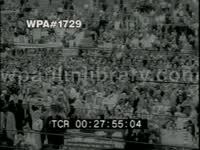 Goldwater Campaign: People applauding and cheering. Barry Goldwater at the podium, he puts on his horned rimmed glasses as he speaks. Shots of crowd rallying for Goldwater. Goldwater Campaign: Senator Goldwater at Springfield, Illinois. He rubs the nose of Lincoln's bronze head. Senator Goldwater gives his own summations of his qualifications for the highest office in the land. 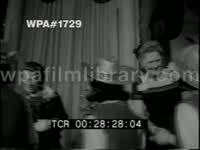 Goldwater Campaign: Various shots of Senator Barry Goldwater and wife on wistle stop campaign tour as voiceover plays "These are old words to you, but appease an aggressor, try to make friends with him and eventually you will have to go to war with him, unless you're willing to hand over your freedom without a fight and I don't think Americans are. I speak as you speak, for peace not war, when I say that America must take a firm line with Communist leaders until their evil systems ceases to threaten the world and threaten the freedom of man and the peace of the world." Goldwater Campaign: MCU poster on the roof of a car reading 'Goldwater for President'. CUs bumper stickers, posters and Goldwater pictures. Goldwater Campaign: MSs Barry Goldwater Jr campainging for his father, his is signing lots of autographs. Goldwater's children & his wife are also shown meeting voters in a campaign notable for family participation by the Candidates. 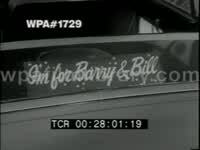 Barry Goldwater Jr.& Mrs Barry Goldwater (Peggy). Mrs. Goldwater (Peggy) shaking hands in a receiving line with her children and other family members. Goldwater Campaign: Barry Goldwater walking in the hotel hallway with his Republican supporters. 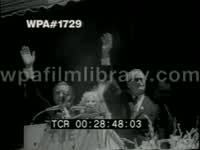 Barry Goldwater standing at the podium and waving to his supporters. 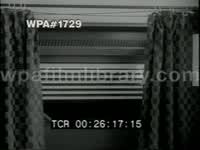 Johnson Campaign: President Lyndon Johnson takes to the campaign trail with the verve of an old campaigner. To the dismay of the Secret Service, he insists on mixing with the crowds. Throngs holding LBJ poster board signs. 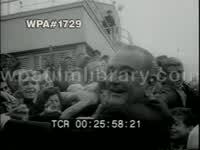 President Johnson waving, smiling and shaking hands of the public. Johnson Campaign: The First Lady as well as Luci and Lynda Bird on the campaign circuit. The girls presiding at barbecues. Lucy Johnson at a BBQ. Looks good their making ribs. Lady Bird Johnson with her daughter Linda standing on the back of a campaign train waving to the public. Johnson campaign circuit. Whistle-stopping through Dixie. 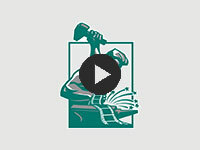 Johnson Campaign: United Steelworkers of America welcomes President Johnson. 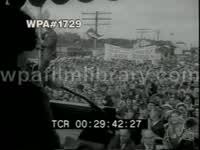 MS - President Johnson standing on a raised platform speaking to a crowd of political supporters. President Lyndon Baines Johnson, "A united country, a unified America, submerging pay difference in common purpose will find no limit to its achievement. We have the knowledge. We have the resources. We have the tools. All we need is the courage and the faith and the vision. You know in your heart I'm telling you the truth." 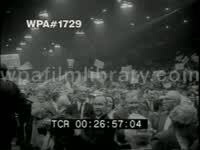 Johnson Campaign: President Johnson among the Democratic supporters shaking hands. 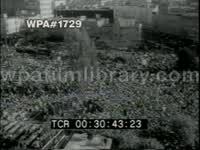 The 1964 National Democratic Convention was held in Atlantic City, New Jersey. Inside the Convention Center are throngs of supporters holding up posters, balloons, banners and signs of support. President Johnson on a raised state with his family. 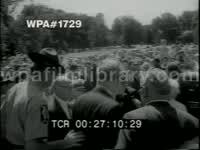 Back in Washington waling outside the White House with a crowd of people following him, as they all take part in the afternoon stroll President Johnson is talking and it looks like he is answering questions. The White House.